As a pilot, whether you are an individual private pilot or as a part of a larger commercial operation, flying in cold weather operations is inevitable. No matter where you reside, chances are you will have to navigate through cold, wintery weather at some point or another. That’s why it’s important to train for cold weather operations — and the best way you can do that is through our online aviation courses at CPaT Global. With comprehensive aviation training courses, pilot specialty courses, aircraft-specific training, aircraft maintenance, and cabin crew training, there is something for everyone here at CPaT Global. Our aim is to make the world of flight training that much easier, more convenient, and all-encompassing. Keep reading to learn more about our cold weather operations training and contact CPaT Global today for the top online aviation courses around. At CPaT Global, our students gain access to the top online aviation training systems in the world. With comprehensive coursework, interactive training documents and charts, and 24/7 live support, pilots get all of the tools they need in order to earn and maintain their certifications in a variety of specialties. One such general subject training course we offer is for cold weather operations, which is crucial for private and commercial airline pilots and maintenance crew. Course Description: This cold weather operations course encompasses all aspects of cold weather operations, including airframe icing, induction icing, preflight preparations, in-flight management, and considers important takeaways from previous case studies and incidents in which icing played a contributing factor. Training Time: This course is a simple, yet comprehensive, training tool which is designed with a study time of just 25 minutes. That time is customizable to meet your airline’s training footprint hours. The course contains five learning modules, each combining to provide around approximately four hours of interactive training. 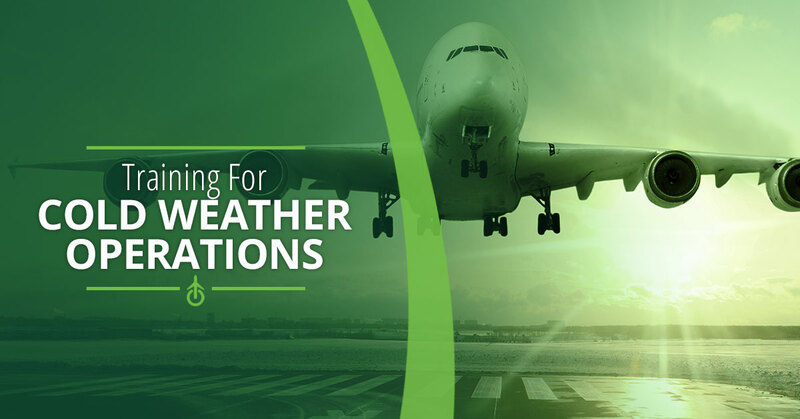 Cross-Platform Convenience: As with all online aviation courses from CPaT Global, this cold weather operations training module is delivered through our online and/or mobile application. Our app is operational on PC, iOS, iPad, iPhone, Mac, and all Android computers, tablets, and devices. Regulatory Compliance: Our online aviation courses meet FAA, EASA< ICAO, and DGCA requirements, thus providing the highest level of learning and necessary compliance. Along with our online training course, you should be well-versed in the many aspects of flying in the cold elements. This will not only help you remain compliant, but will also add a layer of safety and expertise to your skillset. When it comes to flying, whether private or commercial, safety is the number one priority, after all. Gear: This is particularly important if you are flying a private jet or a one-man aircraft. While you may think it will be safe and warm in the cockpit of the plane, you also have to consider the conditions outside should you be forced to make an emergency landing. If you have to exit the plane for any reason, you will need to be equipped with gloves, jackets, a hat, and other layers — both for you and any passengers you have. Practice Often: Pilots truly need to be masters of their craft. For their own safety and the safety of their passengers, it is important that pilots have experience not just flying, but also taking off and landing in a variety of conditions. If you have the capability, practice take-offs and landings on runways that are snowy as often as possible. Understand Protocol & Procedure: Of course, this is a crucial part of staying compliant as a pilot. Whether you are preparing for a winter flight or simply feel that you need a refresher, it’s important to review and study your aircraft’s cold weather procedures, limitations, and emergency checklists. Try to do this at least once per year. Diagnose Weather Patterns: Being able to properly read a weather pattern will come in handy during any time of season. It can be especially helpful, though, come winter time. Monitor your flight path, destination, and current location to better understand your aircraft’s limitations and develop a proper flight plan. Cold weather operations is just one important example of the online aviation courses offered by CPaT Global. Learn more and contact us today to get started.